At this time of year in Ohio we are seeing the leaves change color and fall to the ground. Our outdoor walks provide us with crunchy leaf textures to trample and there is a different “fall” smell in the air around us. A leisurely stroll down the block will show us fallen acorns, black walnuts, and other tree products eagerly gathered by squirrels as they dart to and fro on the ground and along tree branches. We have a squirrel living in the ornamental pear tree in our front yard, and I like to pick up loose acorns and other such treats when I take the dog for a walk and then place the nuts in the nooks and along branches for “our” squirrel to enjoy. When my children were younger we took lots of nature walks, and I gave each of them a bag for collecting pretty leaves from different trees. We used tree identification books to figure out the names of the trees we saw, and we preserved a leaf from each different tree in a nature notebook. After pressing the leaves in a book, we glued them to a page where we listed all the information about what kind of tree it came from, where we found it, and the date we collected it. It was fun to read the book throughout the year and review if the leaf was simple or compound, when we had collected it, and more. Over the years, our collection increased and it was a challenge to see if we could find a new specimen that wasn’t yet represented in our nature book. Those times spent in nature are some of my favorite homeschooling memories for this time of year. My son, Josh, gave me another fall memory that is equally imprinted in my mind. With his AD/HD, auditory processing, and sensory issues, Josh often said or did unexpected things. His impulsivity gave him a tendency to do whatever came into his head, with the result that I often found myself trying to figure out what was going on with Josh based on what I was seeing and hearing. Our special needs children do what comes naturally to them, and often don’t realize that not everyone experiences things the way they do. In this instance, Josh starting making weird vocal sounds as he played. I went into my analysis mode as I observed him. Is he stimming? Has he developed a vocal tic? Is he trying to calm and organize? Alert himself? Keep others at bay? Provide sound effects for what he is playing with? Can he stop making the sound if I ask him to? The speech therapist in me tuned in to see if the sounds Josh was making could be considered vocal abuse and could physically harm his voice. As I observed Josh, he seemed content. He could stop on request, but returned to making the sounds a minute later. It was not vocally abusive and his pitch and volume were within acceptable ranges for his “normal” voice. In the back of my mind, I recognized something vaguely familiar about the sounds Josh was producing. Then it hit me and seemed so obvious that I almost laughed at not recognizing it sooner. Josh was reproducing the noise of a leaf blower! Once I realized it, I became aware that somewhere in the neighborhood a leaf blower was in use. It was faint and distant and I had not even registered it. But Josh had an uncanny ability to imitate noises and he heard things that most people don’t notice. He did a pretty accurate leaf blower noise. He also made airplane and vacuum cleaner noises, but I recognized them right off the bat. The leaf blower noise took me awhile, but whenever I hear one in use I still smile and think of little Josh’s noise imitation talent. When a child is disorganized and distractible, he needs more direct instruction in learning executive function skills. So how do you teach what seems to come naturally to some people? How do you teach a child if you share these struggles with them? Just how many Tootsie Rolls must be doled out before a child learns and generalizes a skill?!? I recommend the book “Smart But Scattered” by Peg Dawson and Richard Guare. Billed as “The revolutionary Executive Skills approach way to helping kids reach their potential”, it is packed with practical ways to identify and address issues related to executive functioning. I found a copy at my library and it is available on Amazon.com as well. As for concerns about too many Tootsie Rolls, I feel your dental pain. Here’s the upside with our distractible kids…they love/crave/need variety so the rewards not only can be changed, they should be changed now and then. And if your family is like mine, you do not need more trinkets cluttering up your house. For example, you could use a reward to work toward a larger prize by having two zip-loc bags side by side marked in some way to make them distinctly different. A small set of Legos goes in one bag, with one piece being transferred into the “I did it!” bag with each completed task. You could tape the picture of the completed object on this bag for added motivation. When all the pieces have been transferred the child can make whatever the set was designed to make, or if your child is like my son he can make something completely different! This is also a great way for your child to earn back toys that have not been put away or have been forgotten under the bed or in the bottom of a toy box. In any case, the child is getting rewarded for completing tasks and learning patience while working toward a larger goal or prize. The rewards don’t have to be big or expensive, just rewarding. I used to sing the song “I’m proud of you” (from Mr. Roger’s Neighborhood) to my kids when they did something well. It cost me nothing and took only a minute, but the children got the acknowledgment they needed. The entire song went like this: “Proud of you, I’m proud of you! I hope that you are proud of you, too.” The song repeats one time and it’s over. To this day, my children remember this song. Since you may not always be physically with your child when she completes a task, try recording a celebratory song on an inexpensive recording device and have her play it for herself when she completes a task. She can keep it in her pocket or you can leave it at the task completion spot. Again, if things tend to get buried or misplaced at your house try using industrial Velcro to keep it in one place. And now…(drum roll)…for the distractible adult here are a couple tips we’ve tried over the years. First, and only moderately successful but better than nothing, when my easily-distracted husband sets out to do a task I remind him of his goal and loudly hum the theme from Mission Impossible. “You’re in, you’re out!” I helpfully remind him as he heads out the door. The other tip I’ve used on those especially scattered, brain fog days is to wear a recording device and tell myself what I need to remember. I record a message, then when I get to the top of the stairs or in another room (yep, it could have evaporated from my brain already) I listen to the message. Usually it’s something simple like “I’m going upstairs to get my sewing scissors.” Sometimes I throw in an encouraging message like “You’re the woman!” just to keep my motivation strong. Check your cell phone for an application that allows you to do voice recordings. That might be a good technology tool for distractible teenagers to use. It’s faster than writing things down and we almost always have our cell phones nearby. Plus, cell phones are less likely to be lost than scraps of paper with hastily scrawled notes on them. I am both excited and nervous when I think about finding a match “out there”. Once I send in my information and it is put on file, anybody looking for someone like me could find it. It might happen soon, or there might not ever be anybody out there who is a match for me. I have to be ready at any time to respond to my potential match. I can’t control if and when things might happen. But if it does, I know it will be worth it and I will be ready at the right time. Let me explain. For those of you who know me personally, try to stop freaking out now. I am NOT leaving my husband of 25 years. Scott and I are doing fine. 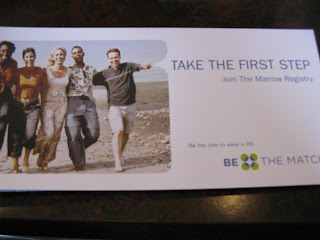 I’m talking about “Be The Match”, the National Marrow Donor Program. I work with medically fragile children. I have friends and relatives who have gone through serious illnesses. I have heard stories of people struggling with health issues, and I’ve often wished I could do something more to help them. The Be The Match program allows me to be available in a way that could be life changing. Signing up is easy and straightforward. Just go to this site: http://www.marrow.org/ and read the information. If you decide to join the registry you simply fill out some information on line. Then, if you qualify to be a potential donor, you will be sent a kit and further information. Once the kit arrives, just follow the directions, do the cheek swabs and mail the completed kit back. Your kit will be processed and you will be added to the donor registry. If you are matched for a donation, the doctor will decide which of two different procedures to do. From what I read, it seems that the discomfort is minimal and the recovery time is brief. It seems like a small sacrifice when there is the possibility of saving a life. If your health is good and the desire to make a meaningful difference in this way appeals to you, I encourage you to consider joining the registry. Even with the millions of people who are already part of the registry, there are still many people who are unable to find a match. You might be the one among millions who could be an answer to prayer. Sensory Issue: He’s sniffing EVERYTHING! You are both right – he needs to stop the gross/embarrassing behavior, and…he can’t. I always try to think about how every behavior, no matter how quirky, is meeting some kind of need. We do things that are somehow rewarding to us. With that in mind, you can’t just tell a child to stop smelling objects because something in his brain is telling him to do those things. But in your family, in our society, those things will never be acceptable. So you have to try to come up with something that meets those sensory needs and is also an acceptable behavior. Some of the solutions might still be considered “quirky”, but there are degrees of quirky and some are easier to take than others. For the sniffing, try soaking a cotton ball in something with a distinct smell and keep it in a snack-size ziploc bag for portability and easy access. You might want to have several separate bags with different smells, and when your son feels the urge to smell something you can redirect him to one of the cotton balls. (Ideas include: cologne, coffee, air freshener, extracts – peppermint, lemon, cinnamon.) You know what smells your child can handle and what ones might set him off, so you choose what works for you. If you discover a favorite scent, you could apply it to a handkerchief or piece of material that he can keep in a pocket and pull out to sniff as needed. My friend decided to try various aromas on cotton balls and used a large pill case to house each scent separately. The pictures above show her solution, and here’s what she says about it. I bought a pill holder and put cottonballs scented with different things inside each of the seven compartments. Now, whenever my son has the urge to sniff, he can grab that, open one, and smell away. I used vanilla flavoring, coconut, perfume, lotion….anything that had a strong smell and I tried to find some different from each other. Still quirky, yes….especially in public…but way less quirky than dropping to all fours and smelling a floor in public.